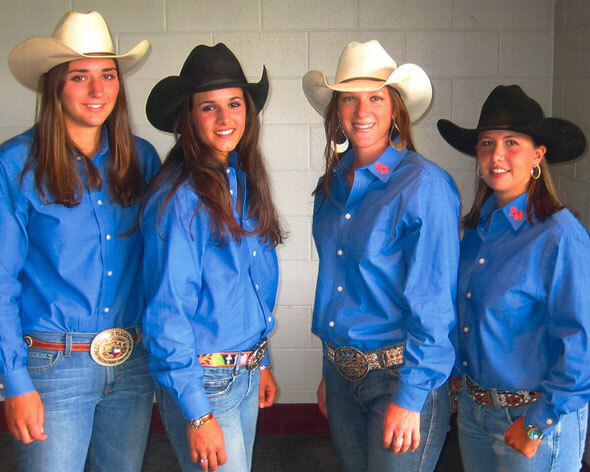 The SHSU women’s rodeo team rode, roped and tied their way to a fourth place finish in the College National Finals Rodeo, held June 10-18 in Casper, Wyo. The team, consisting of special education major Wendy Schuller, marketing major Kristi Lee, agricultural business major Haley Kolle and pre-medicine major Callie Albrecht, combined for a total of 353.3 points to give them fourth place out of 35 women’s teams. SHSU fell behind Tarleton State, the University of Nevada-Las Vegas and the National American University, which picked up first through third, but beat out such universities as New Mexico State, Texas Tech, McNeese State and Texas A&M. Within their respective events, Schuller placed as the reserve champion in barrel racing, sealed by an impressive last run time of 13.89 seconds. Lee, who was the women’s all-around champion at the regional rodeo and went to the finals in two events, finished fourth in breakaway roping out of 56 participants, 14th in goat tying out of 45, and was third in the college finals women’s all around with 138.3 points. He added that he feels the women’s team is very strong, and only losing one team member, he has great expectations for them next year.